The meta-dominating support is getting her first skin since 2014. A new skin for Zyra was teased on the official League of Legends Twitter earlier today, and it looks awesome. 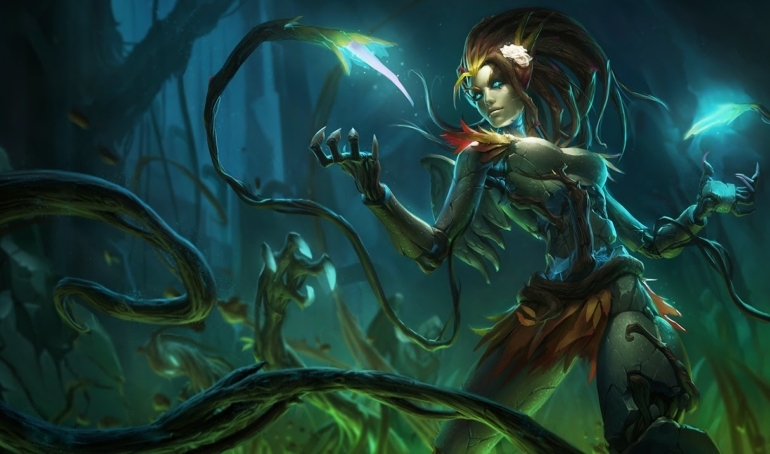 Zyra has been at the center of the support meta for a few months now, thanks to her impressive ability to deal damage and lock down opponents with crowd control, even into the late stages of the game. She’s been a popular pick in the professional scene and in regular games alike, and her emergence into the meta means that now is the perfect time for a new skin. This will be her first skin since SKT Zyra in 2014. The skin’s teaser is themed with dark purple and black, and we also see what appears to be a lizard-like head on the end of one of her vines. The teaser also shows a purple, bloated egg, which tells us that Zyra’s theme in this skin will likely shift from plants spawning from seeds to these lizard or hydra-like monsters bursting from eggs. The purple also suggests that it may be related to the void, League’s netherworld full of nightmarish monsters that are traditionally purple. A void-fueled Zyra that hatches hydra lizards from eggs sounds like a pretty cool idea, and support mains everywhere will be anxiously awaiting more details on the skin.